If you're of the ilk that believes there is nothing more marvelous than Marvel, then chances are you're finding it difficult to hide your excitement over the upcoming release of Black Panther. (Raise your hand if you fit into this demographic.) When the movie was announced, we couldn't believe it; when the character made his debut in Captain America: Civil War, we were in shock; and when we first saw the trailer, we cried on the inside and clapped on the outside (or vice versa). Basically, we're more than just a little pumped. So, with the anticipation growing (and our sanity dwindling), maybe it's time to find some relatable memes to help ease the torture of waiting. Keep reading to check out 15 Black Panther memes that prove T'Calla IS king. When the Black Panther trailer was released, fans weren't just blown away, they were immersed. In the tradition of movie trailer premieres, like Avatar and The Force Awakens, viewers watched this trailer and felt as though they were genuinely lifted into the fictional world to which this movie belongs. It was a Wizard of Oz moment. Basically, you either don't care much for the MCU at all, and the moment came and went, or you felt 100 percent transported into the fictional Wakanda, no longer believing that said place is actually even fictional. Whether or not this viewing experience actually changed the way you dress is anyone's guess, but the impact was still ridiculously strong even so. Black Panther proved his worth in Civil War; now he's going to prove his royal status. Remember that time Captain America had a third movie in his trilogy, but the focus was on pretty much everyone but him? Now, everybody loves Cap. Unless you're the kind of person who hails Hydra for fun, this character represents everything that is good in people. He's broken and lost at times, but he's otherwise the epitome of a hero. Sadly, though, by the time Civil War came around, everyone's eyes were elsewhere. First of all, audiences were getting their first official glimpse of the new Spider-Man. So, yeah. Very cool. What's more is that they were also getting their first official glimpse of freaking Black Panther, which, by default, knocked Cap down a few tiers on the relevance charts. Love you, Cap, but—c'mon—this dude is literally a freaking king. A lot of the appeal surrounding Black Panther is how naturally cool he is. He shows up in Civil War, and there's already this air of confidence surrounding him. He's likable, powerful, intimidating... the guy is firing on all cylinders. So, if the Internet wants to go ahead poking fun at him, let's stand together and wish them luck... because their goals are futile. T'Challa is just too inherently cool. You want to dress him up as the Pink Panther? Still cool. You want to dress him up as Panthera from Thundercats? Still cool. You want to photoshop him dressing up as Bagheera from The Jungle Book? Fine. Go for it. But you're wasting precious time. The guy. Is still. Cool. You're only making yourself look bad at this point. It's exciting to see Hollywood finally broaden their creative scope on movies that are about more than people who just so happen to be white and male. Hollywood is slowly, but surely, embracing a wider gamut of the population, and it's about damn time. That said, though, everyone celebrating the fact that "It's nice to finally have a black superhero in a movie" may as well throw characters like Sam Wilson under the proverbial bus. The dude has been holding strong the MCU ever since Captain America: Winter Soldier, and yet nobody cares enough to show him any love in this particular sort of discussion. By all means, let's be happy that Hollywood is finally getting its ducks in a row, but let's not do it at the expense of our lovely Falcon. Tom Petty once sang that "Waiting is the hardest part," and he couldn't have been more correct if he tried. Now, the late, great singer couldn't have possibly been referring to the release date of Marvel's Black Panther, but let's not put it past him. The guy was a musical genius. For all we know, he was wiser than we could have ever known. waiting is waiting, and waiting is torture, especially for something like this. The consolation is that there is no doubt in anyone's mind that it'll all have definitely been worth the wait. T'Challa definitely won the Cool Award in Civil War, but when the trailer for Black Panther dropped, he had no choice but to split the prize. 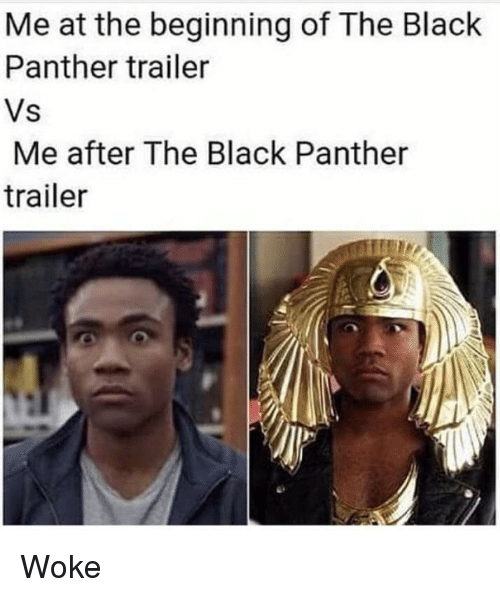 When the villainous Erik Killmonger showed up on screen, transforming into a gold-lined Panther suit with a little more than some fancy ninja moves, T'Challa had to take a step back and accept the fact that this movie was too consumed with equally impressive characters; characters that he'd have to share the wealth with. 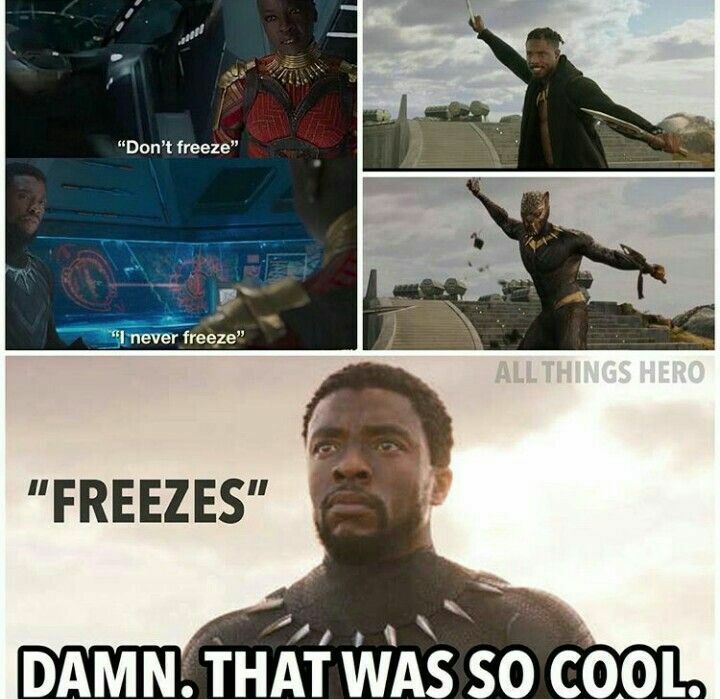 You can tell Okoye all you want that you "never freeze," but when you actually freeze, well, the proof is in the pudding. But don't worry, everyone loves you so much that this will just get tacked on to how human and realistic your character is. One of the most satisfying moments in Captain America: Civil War was the chase/fight between Black Panther and the Winter Soldier. Considering T'Challa wasn't too thrilled with Bucky allegedly murdering his father, as well as countless others, in an explosive terrorist attack, it's no wonder he was upset. Still, despite the dark undertones, it's hard not to be slightly entertained by this meme. Mostly for the fact that it's kind of legitimate AF. Who'd have thunk that Mowgli and Bagheera (damn, two shoutouts already in this post alone) would grow up to be such fierce enemies? Thankfully, Mowgli can now stand up for himself, but still... it's a damn shame seeing these two give up that enduring bond of friendship. Well, thankfully they technically made up by the end of Civil War, so there's a silver lining. If you still find yourself defending Black Panther to the haters, remind them that the guy isn't just subjectively awesome to look at on screen, he takes inspiration from the greats (which is to say, he takes inspiration from none other than Bruce-freaking-Lee). That's right. 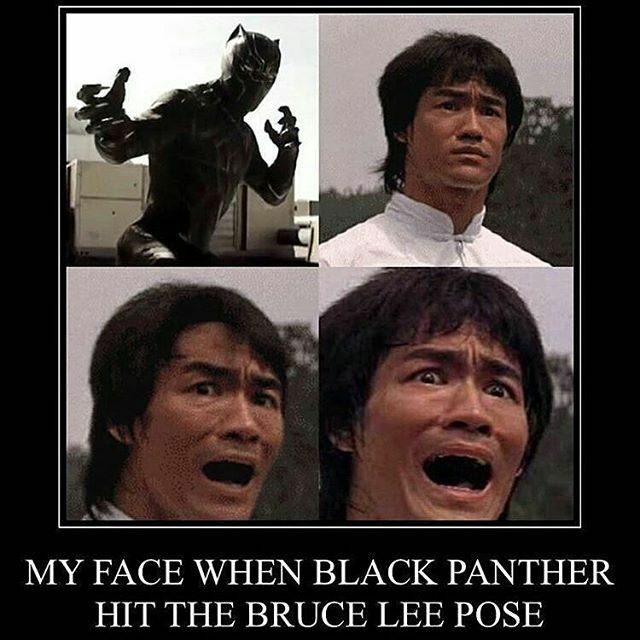 If you're paying close attention to T'Challa's fighting stance, it's the Bruciest, Lee-eist stance that's ever been on screen since, well, Bruce Lee himself. So, if ever there was a reason to swear allegiance to the king, it's got to be this, right? What more proof do you need that the guy is the epitome of all things awesome sauce? What more does the guy need to do for you to put absolute faith into him as your royal leader? Jeez. Don't let fear get you down. Unless you're the Winter Soldier getting attacked by the Black Panther. Then you can let fear get you down — you know, on account of not really having much of a choice in the matter. one could argue that he's actually not even acting. One could argue that the fear of having Black Panther attack him with those fancy moves and death-bringing claws is totes legit. Honestly, though. Look close. Study these shots. Had it been a fuller frame, you could probably even make out the pee stain running down his pants. If you want to be motivated, find someone who inspires you. It doesn't have to be a traditional choice; doesn't even have to be someone who's necessarily inspiring; just someone who makes you see the greatest potential in yourself. For this cat, that motivation is, of course, Black Panther. In the world of cinema, far too many feline characters have made turns for the worse, becoming villains despite their potential. There's Catwoman, Kitty Galore, Mr. Bigglesworth; cats who fell to despair, preferring to side with the Dark Side over the light. (Okay, Catwoman is more of a grey character in terms of allegiances, but she still counts.) The point is, this photo proves how important Black Panther is in this day and age. Not only are people psyched for his standalone movie, cats-who-could-be-panthers are as well. If that doesn't inspire you, your soul may be as good as dead. God, this relationship just gets more and more complicated the more attention it gets. What Civil War taught audiences was that revenge is a dangerous pot to stir. Despite their beliefs, assumptions can get the better of people, pushing them to make poor decisions before truly factoring in truth; letting their most basic emotions get the better of them. What it also taught people was that the Winter Soldier seems like he just really wants to hug and pet Black Panther in this photo. this photo is all kinds of perfect (while also being all kinds of awkward, all kinds of uncomfortable, all kinds of wrong, and all kinds of cute). Basically, there are too many emotions to handle. Most superheroes have their own catchphrase. They're not always what people kind consider "strong," but they exist all the same (for example, Batman's is just "I'm Batman."). 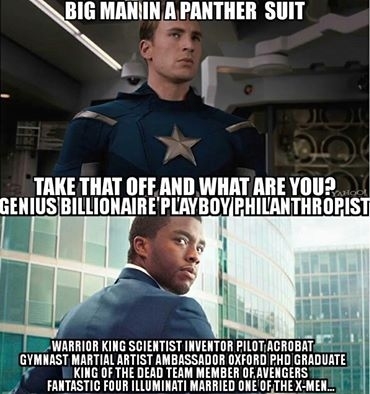 And while Black Panther hasn't even had his own movie release to the public yet, audiences have already crowned him with his very own catchphrase based on his "I don't care" line from Civil War. With that being the case, though, this lack of originality or pizzaz hardly dethrones this buff bada**. In fact, on the contrary, there's something kind of captivating in the brevity. Only certain kinds of people can get away with playing the minimalist card and still coming across like they put a hell of a lot of hard work into their self-image. Also, if you're not a fan, I don't care. If you’re kinda, sorta freaking out about Black Panther coming out soon, you’re not alone. And just because you aren't physically checking off dates on your calendar in preparation for Black Panther doesn't mean you're not balls-to-the-wall excited. Some people just have different ways of showing their emotions. For example, some people are standing inside a ring of fire without a shirt on, saying, "I waited my entire life for this." That said, though, if you feel that this description paints a picture of you at all, then chances are you're either the actual villain, Killmonger from Black Panther, or you're the actor playing him, Michael B. Jordan. Either way, it's a pleasure to meet you. And also, I'm afraid of you. When Tony Stark and Steve Rogers had beef in the first Avengers, it was an acceptable tiff. They've got clashing personalities, their ideals aren't exactly on the same page, and they literally come from different time periods. A difference of opinion was more or less expected, so they get a pass. However, if Captain America ever dares to test T'Challa's patience, don't be surprised when the king turns the tables on Rogers and makes him eat his own words. Oh, you want to throw down with Black Panther the same way you threw down with Iron Man? Good luck. T'Challa is a force one should not consider messing with, because when all is said and done, you are the one who's going be left looking like a chump. If you want to be the baddest, get in line. Between Marvel and DC, there are pretty much superheroes to spare, so don't be surprised when you find yourself being overlooked. That said, though, seeing as you're standing in line anyway, you may as well keep an eye on your competition. In one corner, you've got Batman. He's rocking some serious dough, kicking tail with his trusty utility belt, and bringing justice to Gotham City. In another corner, there's Iron Man; equally wealthy, fighting crime, and rocking a gnarly suit to supply him with power. But then, in another corner, there's Black Panther. Not only is he richer and suaver, the dude doesn't even need fancy weapons. Why, you ask? Because his hands are weapons.